Lomilomi Practitioner. A sense of ‘Ohana (family) is created through Potluck meals, networking, reading, writing and homeplay assignments to further enhance our learning. This is an incredible opportunity to embody lomilomi, and to understand, practice, and feel confident with this beautiful healing style of work. Full class commitment is preferred. We go home with reading, writing and homeplay assignments to further enhance our growth as lomilomi practitioners. Free overnight stay available in Olympia before or after class. The first and last class includes an evening dinner to Get to know each other better and celebrate graduation at the end. During the course we will create together a deepening in our lomilomi bodywork skills by exploring the HaHawaiianling Arts in 7 different parts of the body. We will have a session on the back, the shoulders, the sacrum and hips, the legs and feet, the belly and chest, the arms, the neck and face. We will also explore through reading, journaling, discussion, and art, principles and values from the Hawaiian traditions and how they can help us to grow and deepen our own spiritual and practical life. Ka ‘Imi Pono means the search for right relationship in our lives with ourselves, our family and friends, our clients, and the earth we live on. We will begin by sharing about who we are and a vision statement that speaks about who we are becoming and working with Ha (breathe of life). We will learn about responsibility our Kuleana and how to build our Sacred Marriage within, we’ll cultivate our Aloha (compassionate presence with ourselves and others) while we connect and open our sacred well. We will explore our internal ‘aina (land) and how we connect with the earth. 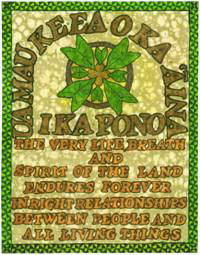 We will explore incorporating ho’oponopono (to make right more right) into our lives and our practice. We will sense into our ‘Ike our inner knowing and how to use it to help us have balance with work and play. And finally we will look to our future countenance carrying our visions forward in balance with the mother/father/child within connected with spirit. We will have books and articles to read and ponder between each class, journaling and art to express what we are learning, and a lots of opportunity to share in discussion with each other. You are all welcome to sleep-over in our new bunkroom and guest rooms the night before class begins, or after class ends if that will facilitate the journey for you. Continuing Education: 49 NCBTMB credits. Heartspire School of Hawaiian Massage is approved by the National Certification Board for Therapeutic Massage and Bodywork (NCBTMB) as a continuing education Approved Provider (#450029-06). The description below is from the 2013 Camp Retreat. Friday: 11:30 am to 6:30 pm, Saturday: 9 am to 6:30 pm, Sunday: 9:30 am to 4:00 pm. 20 Hours – $400 This class focuses on approaching the body through the extremities’ and teaches the flowing torso work from both Aunty Margaret and Sherman Dudoit. You are open to staying overnight for the weekend to experience the full retreat. Potluck meals, hot tub, and beds for 8 available. Sign up early. Two week advanced registration afterwards the price goes up to $460. Indian Summer Camp Retreat – Brand New Teachings explore long strokes up the entire body, deep clearing of the rivers through the legs and feet grounding with the earth, flushing and releasing the arms and hands allowing gifts of the heavens to be received, opening the heart of the child and belly to the wisdom of full body alignment. We will explore the metaphysical story of the body and how we can move forward towards our hopes and dreams and support our clients to do the same through clearing and releasing old patterns and accepting Aloha in our lives! Being at Heartspire fosters rest and rejuvenation through good bodywork, connections with other body workers, time to soak in the hot tub, walk on the meditation trails, enjoy fresh eggs and greens from the garden, share fabulous potluck meals we all participate in creating, and pet the animals. Sign up early as class is limited to 12 students. Lomilomi offers an opportunity to change up the flow and creativity of your work. During our studies over the last 25 years, 7 of our 12 teachers have been men, so this work is very conducive to both women and men. Lomilomi draws on the Hawaiian Marshall Art form of Lua and the dance form of hula. The Hawaiian strokes use soft/deep techniques through bodyweight/leverage, which include the use of the soft underbelly and the ulna blade of the forearm, elbows, hands, soft knuckles, and fingers. Balancing the masculine/feminine/ child is part of the Metaphysical story of the work, along with prayer, intention, and learning a Hawaiian Blessing Chant about Aloha. Being at Heartspire fosters rest and rejuvenation through good bodywork, connections with other bodyworkers, time to soak in the hot tub, walk on the meditation trail, and share fabulous potluck meals. Overnight free for 8. Class limit is 12 students.